When you leave a comment on THIS post by 6 p.m. CT Wednesday, September 25, 2013 you'll be entered in the DRAWING for a copy of the book mentioned below. If you mention in your comment that you’re a follower (see in the left column “Join This Site” and “Follow by Email”), I’ll add your name a second time in the drawing. You must be eighteen, have a U.S. mailing address, void where prohibited. You can read details about my book giveaways at Disclaimers. Life for me began in Greeley, Colorado. My father died when I was three years of age which left my mother with a senior in high school son, a kindergarten daughter, and me. She had not worked outside the home and did not receive social security. We lived on savings for a while, but then the money became scarce. My mother married a man who steadily abused alcohol until it overtook his life, and ours. The verse from Joseph’s life follows me throughout mine. “>>>>>meant it for evil, but God meant it for good.” The years our family endured living in a dysfunctional alcoholic family were difficult, but they prepared me for the work of my life. For twenty-six years, I worked in a school district described as “an urban school in a suburban setting.” Many of my students lived in conditions similar to those of my childhood. Half of my teaching years were spent with behavior disordered boys. Their emotional disturbances reflected the homes from which they came. As a teacher, I related to them and understood why they reacted as they did, but never let their backgrounds be an excuse for bad behavior or failure. Together, we worked on making wise choices on a daily basis. God had prepared me to teach to a group of children who are sometimes written off by society, but who hold great untapped potential. While teaching, the stresses of the day played on my heart and mind. By journaling the day’s events, a lot of anxiety was released in the writing and thinking process. Reflecting on the written material sometimes helped me to realize the problem and find a solution. Eventually, these entries became the basis on my devotional book, Teaching Diamonds in the Tough: Mining the Potential in Every Student (Lighthouse of the Carolinas, 2012). Hopefully, the series of vignettes will inspire this generation of teachers to look beyond the surface of a child’s behavior to their heart. This summer, Oak Tara Publishing is releasing the first in the series of books Teachers of Diamond Project Schools: Diamonds in the Rough. Second Chances is essentially my story of coming to Chicago and teaching after living my high school years in a small town in Wisconsin. In this romantic contemporary novel, the first year teacher confronts the difficulties of teaching children of poverty, gangs and drugs. Her personal faith is challenged, but she learns to rely on the Lord to make it through each day of teaching. She longs for the unconditional love shown by the fifth grade teacher whose husband suffers from MS multiple sclerosis. Eventually, she falls in love with a police officer who is chaplain in the jail. My personal background prepared me to write this series of books. In the fall, Book Two, Miss Bee and the Do Bees will be released. It is the story of a special education teacher in Diamond Projects. My husband of 43 years, Vernon, has shown the unconditional love needed to sustain a marriage. We now are retired, volunteer at the Bible League Thrift Shop, grow produce in our garden for Share the Harvest, pack meals for Children’s Hunger Fund, and teach Children’s Church. I write for the Worship Team in our local church. Three grown children with spouses and ten grandchildren join our two cats for fun. God has been good to me. Join me on the web. My blog is Teachers and Other Everyday Heroes. I try to blog once a week, and write about people who are ordinary but have done something extraordinary in their lives. Check out the blog about the Dutch Garbio (or Garbagemen) ) on my blog. They typify so much about the immigrant work ethic. On the blog that is guest written by a mother catapulted into the role of caregiver to her high school daughter. Please email me with your comments and concerns. 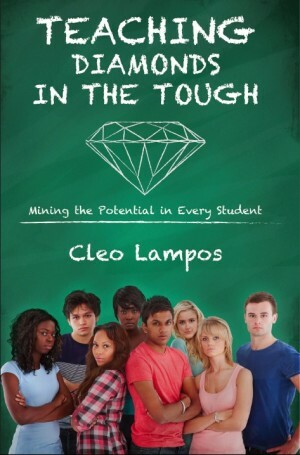 Teaching Diamonds in the Tough: Mining the Potential in Every Student is available on Amazon. Remember: leave a comment on THIS post by 6 p.m. CT Wednesday, September 25, 2013 and you'll be entered in the drawing for a copy of Teaching Diamonds in the Rough: Mining the Potential in Every Student by Cleo Lampos. Please, please remember to leave your email address. I’ll need you email address so that should you be the winner I can get in touch with you. I’ll announce the winner in Monday’s blog. REMEMBER, WE HAVE TWO GUEST BLOGGERS TODAY--Featherling and Lampos. YOU MAY LEAVE A COMMENT ON BOTH. EACH BLOG POST WILL HAVE A BOOK GIVEAWAY. Jane, Having taught you'd probably enjoy this book. Thanks for leaving your comment. So glad you follow my blog!! Christina, thanks for reading and leaving your comment. I was a houseparent in a children's home for abused & neglected children for a number of years, & understand SO well - how home life can affect a child's behavior. Would like to read your book - thanks for the giveaway opportunity! Bonnie, your houseparenting was surely an experience. Thanks for leaving your comment. So glad you follow my blog! !